If you could knit the patterns from only one designer, who would it be? I have a couple of friends who are huge fans of Jared "Brooklyn Tweed" Flood, for example. Others knit many of Anne Hanson's designs. For someone else, it might be a designer of lace, or quick projects. For me, as those who know me will attest, it would be Kaffe Fassett. As a colorist, he is very talented. I find myself wanting to make many of his designs, some of which go back to the late 80s/early 90s. The shapes may be rather boxy, but I don't mind. I can make changes if I feel like I want to. 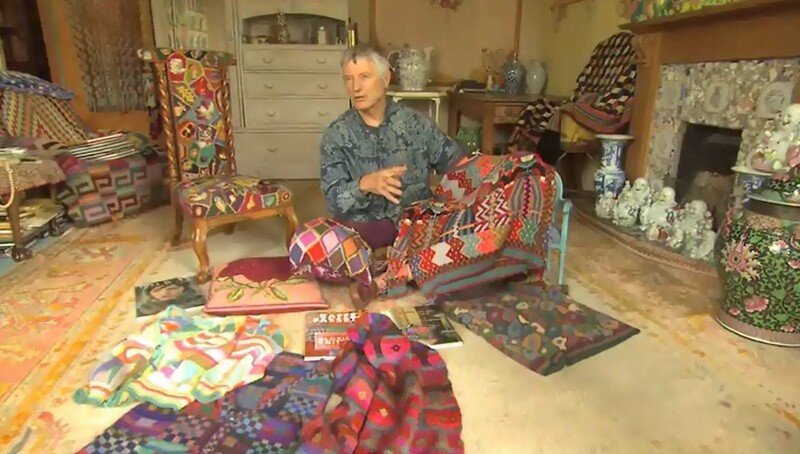 I went to his website and found this interesting video: http://www.kaffefassett.com/Biography.html - then click on the picture on that page. I love color and find myself very anxious to start something new, so I will, this weekend. I'm going to start on his Triangle Squares Cushion. There are 19 colors in the cushion, a combination of Rowan Cotton Glace and Revive. So, tell me, whose patterns would you knit if you could only choose one designer? My favorite thing about Kaffe is his bravery with color. I admire that so much. As far as pattern, though, I would have to say Ann Budd. Her style is pure simplicity, and, for me, it's the perfect spring board to express my own artistic creativity. Tough question! I'm not sure I could pick just one designer, but I relate to what Dave D said.